At last week’s IATA conference in Sydney, there was once again a small ‘pop-up’ exhibition from suppliers, peripheral to the airline business. 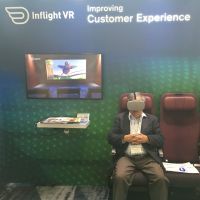 Attracting considerable interest was Inflight VR, established in 2014 and based in Munich and Barcelona, whose headsets could see the end of seatback in-flight entertainment (IFE) units. Currently, virtual reality (VR) is used essentially in gaming and other such activities but has a much bigger potential. One of its obvious applications is on board an aircraft, with a huge weight reduction (400gms per unit and soon to be 300gms) compared to the heavy plasma TV screens currently in use. What you see is the same screen as previously and a cursor to click to follow a route to whatever your application is. Presently stand-alone, plans are to communicate with an aircraft’s internal wi-fi system, and its programmes. Thanks to the VR headsets, passengers can believe they are in a 3D cinema or perhaps opera house. They can check the time to landing and what gate to go to for the connecting flight. The biggest beneficiaries could be regional and low-cost carriers, typically Flybe, which can charge customers on the 2hr flight from Aberdeen to Heathrow. It can offer a better service than competing airline BA, with no seat-back screens.